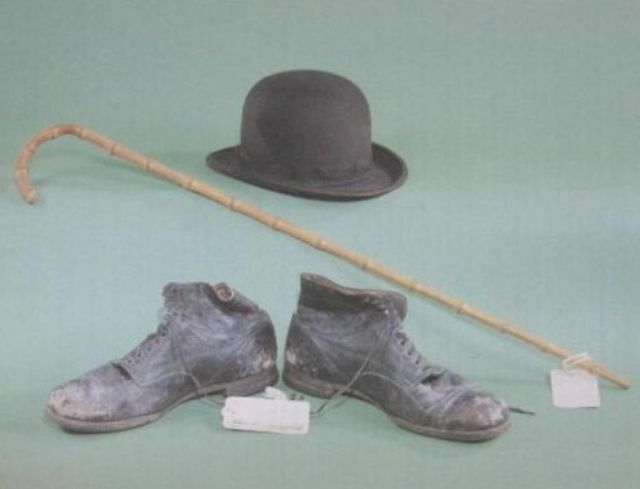 This set of screen-worn items – a trademark bowler hat, cane and large floppy shoes – sold as part of a large collection of Chaplin memorabilia at Christie’s in December 1987. Authenticated by Chaplin’s former wardrobe master Ted Tetrick, the trio of items were sold as a single lot to the Danish businessman Jorten Strecker for $150,000. 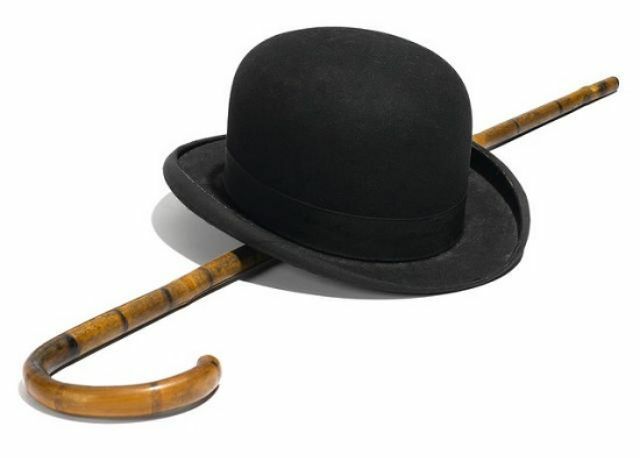 This bowler hat and cane were worn on screen by Chaplin, selected from the studio’s costume department and stamped ‘The Chaplin Studios Inc. California’. They were consigned to auction at Bonhams, accompanied by a letter of provenance from Ted and Betty Chaplin Tetrick who acquired the items after the death of Chaplin’s studio manager Alfred Reeves in 1946. 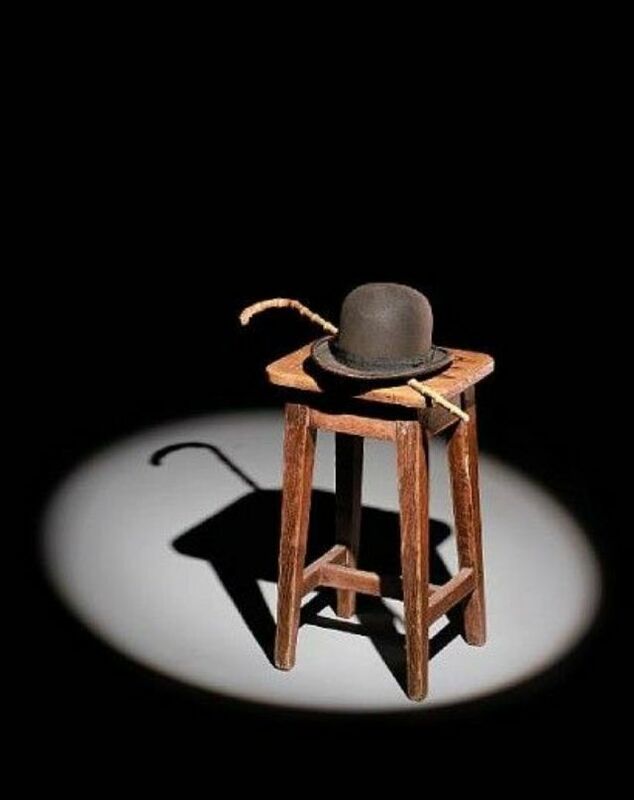 The hat and cane sold in June 2006 for $139,250. 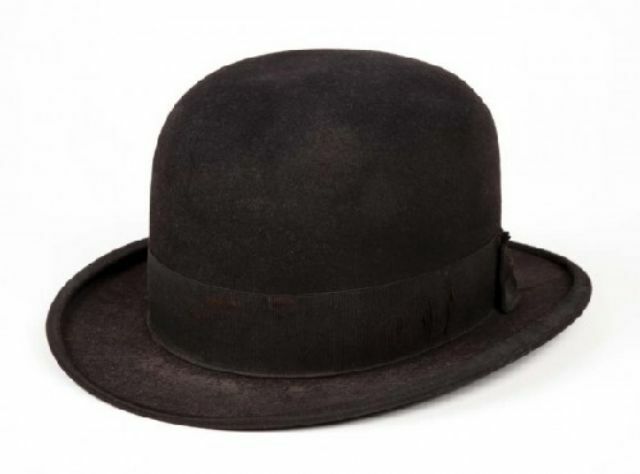 This screen-worn bowler hat was originally gifted by Chaplin to a museum of Hollywood history, and later acquired by the celebrated collector and actress Debbie Reynolds. Reynolds built one of the world’s greatest collections of classic movie memorabilia, but was unable to find funding for a museum to house the collection. In June 2011 she began the process of auctioning off the collection through Profiles in History, where this hat sold for $135,300. This cane is one of the few that can be attributed to a specific Chaplin film – ‘Modern Times’, released in 1936. Chaplin signed and dated the cane, and gifted it to his friend Maurice Bessy in 1947. Fifty items from Bessy’s memorabilia collection were sold at Christie’s in December 2004, topped by the cane which realized $91,919. 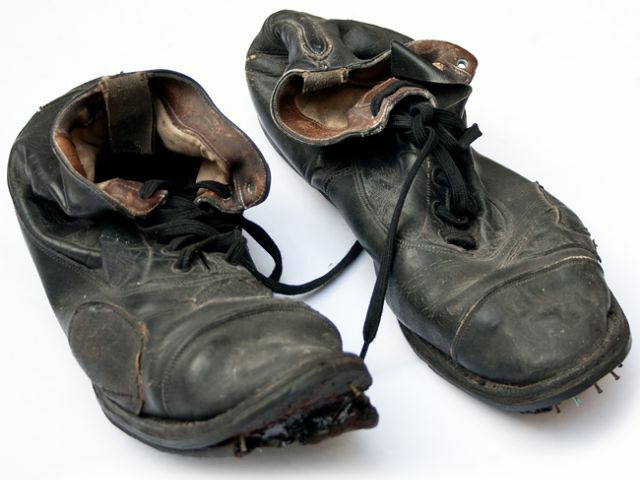 This pair of boots was one of just three worn by Chaplin during filming at Charlie Chaplin Studios, with the other two pairs later thrown out or eaten by mice. Featuring a hole drilled in the heel for ‘stunts’, these boots were authenticated by Ted Tetrick who worked in Chaplin’s costume department and was married to his cousin Betty. They sold to a Swedish museum in a special auction of Chaplin memorabilia at Christie’s in December 1987, for a price of $70,840. This hat and cane were originally owned by Katherine Stubergh Keller, a famous artist who created wax sculptures of famous figures from Hollywood stars to U.S Presidents. Chaplin posed for Stubergh Keller in 1936, and later gave her the hat and cane as a gift. In 1966 she gave the items to Herbert Moore, owner of the Mammoth Cave Wax Museum in Cave City, Kentucky, and in Novemner 2010 they were auctioned at Bonhams for $62,500. 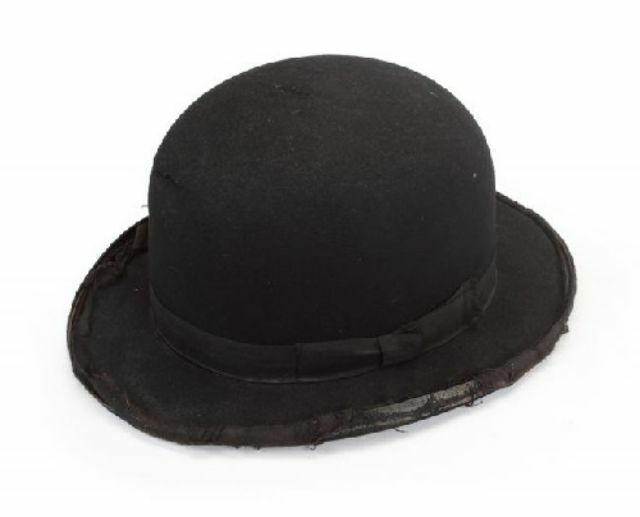 This screen-worn black bowler hat also originated from the personal collection of husband and wife Mirella and Giuliano Canese, and was exhibited at the V&A Museum in London. It sold at Julien’s in March 2014 for $57,600. This screen-used cane was originally owned by Mirella and Giuliano Canese, the couple who spent 25 years in charge of Chaplin’s Manoir de Ban villa in Switzerland. Chaplin gifted the cane to the couple, along with other items of memorabilia, in return for their years of service. 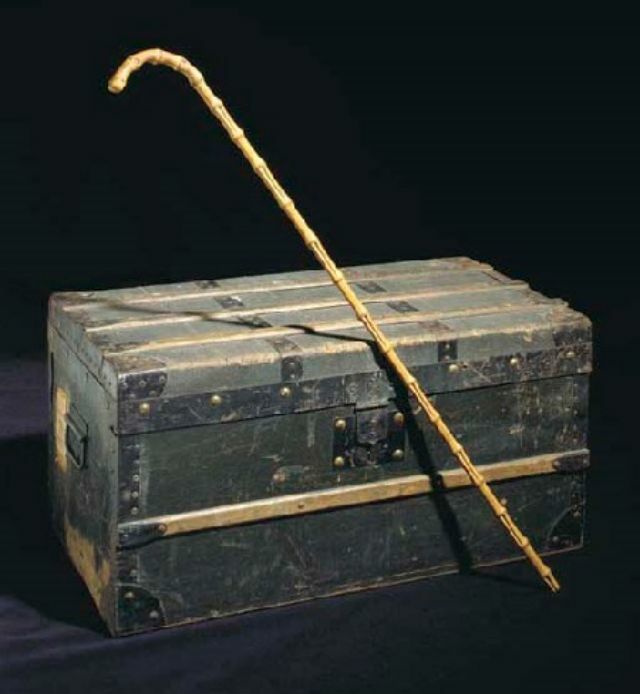 The cane was later sold to Entertainment Museum owner Frans Billen, and in March 2012 it sold at Julien’s for $41,600. 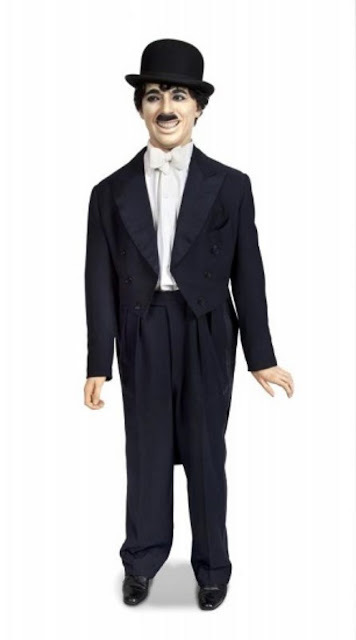 Chaplin wore this navy blue suit at the London premier of Limelight in October 1952, and on-screen as King Shahdov in the 1957 film ‘A King in New York’. It was made for him by London's Stovel & Mason in 1952, on the recommendation of his close friend Douglas Fairbanks Sr. In March 2012 the two-piece suit sold at Julien’s in Beverly Hills for $38,400. This fake moustache was worn by Chaplin in ‘The Great Dictator’, regarded by many critics as his finest film. It was given by Chaplin to his close friend Maurice Bessy, a French writer and film historian who wrote biographies of several Hollywood stars – including the ‘Monsieur Chaplin, ou le rire dans la nuit’ along with co-writer Robert Florey. The moustache was accompanied by a note from Chaplin, which read “To Maurice - thank you for your book - merci! Charlie Chaplin, Sept. 1946” It was sold at Christie’s in December 2004 for $34,470.